Are you a book freak? Then, you’d be over the moon to meet Dawn who goes by Lone Alaskan Gypsy, author of the mysterious ‘A Tundra Tale’. She lives in a small Yup’ik Eskimo Village in Western Alaska – along the lovely Yukon River (ooh she sounds like a fairytale character herself). She spends her days gardening, selling plants, making crafts, writing, fishing, sewing, baking, taking care of pets, fostering children and fur trapping. Whoa this lady does it all, doesn't she? And if you don’t already know she is OBSESSED with writing. Her first book ‘A Tundra Tale’ is inspired by the Alaskan folklore, this fairytale story takes Olive, a twenty-year-old resident of a remote psychiatric hospital, on a journey into the tundra, where with the help of her arctic fox companion, a young Athabascan child, and an old trapper she will discover the secrets of the black wolf, the story of the land's ancestors, and the power of the northern lights that could unite them all. You can purchase a Paperback or Kindle version of this folklore classic on Amazon or her Etsy Shop that ships worldwide. But to one of you bookworms Lone Alsakan Gypsy is giving her exclusive signed copy of 'A Tundra Tale'. How cool is that? You can enter this giveaway, at the bottom of this post. But wait..before that..let’s pick Lone Alaskan Gypsy’s brain. We want to know more about this ah-mazing writer, don’t we? So Lone Alaskan Gypsy, this is your first book. Where did you get your inspiration from for ‘A Tundra Tale’? I live in a small Yup'ik Eskimo village in western Alaska. The story takes place in a hometown a lot like my own- on the flat tundra. I've always been influenced by nature and animals- and the fact humans can have fairytale-like interactions with them. A lot of the fauna and flora of western AK influenced my story. Sasha, the youngest character in the story, is derived from a young girl in my village who I have always had a close connection with. She LOVES to tell ghost stories- which quickly became the focus of 'A Tundra Tale'. There are so many pieces of this book that mimic my real life- with a lot of fun fairytale embellishments. Is Lone Alaskan Gypsy your pen name? What is the story behind it? Yes Lone Alaskan Gypsy is my pen name. I thought of it when I was 19, and started my first Alaskan blog (still online! It's called 'Lone Alaskan Gypsy'). I just thought the name was catchy. The 'gypsy' part is derived from my love of European folklore and traveling. Alaskan is obviously tied to my home. Do you intend to write more books? Oh yes- absolutely! I'm working with an AMAZING illustrator named Dave Dodson, right now- who is illustrating my to-be-released-in-April children's book entitled 'The Dancing Salmon'. It's a folklore story about the northern lights. What authors do you like to read? Who is your favorite? Oh goodness- so many authors. I love Jerry Spinelli, JK Rowling, and Lemony Snicket! I don't have a favorite- I love all books! What book or books have had a strong influence on your writing? I think every book I read, to a certain extent, influences my writing. The books with the biggest impacts have probably been 'Stargirl' by Jerry Spinelli. And the 'Harry Potter' Series by JK Rowling. What was one of the most surprising things you learned while writing this book? I think I surprised myself with the fact that the story wrote itself. I sat in front of my computer and typed- but it was a lot like watching a movie. I was just narrating this story that I was already seeing in my head. Everything in the story is a first-written-piece. I didn't really 're-edit' or change anything. Everything fell together perfectly. My style of writing has always been 'work off of the inspiration'. Nothing is pre-planned, and this entire book was kind of written spontaneously. I'd get an idea while walking outside and then run home and write it down. It all came very clearly. Not necessarily. There are a lot of my personal beliefs that I hid in the pages, but I want people to interpret the book on their own. I want them to decide what it means. I left the ending as a bit of a 'mystery', because I want people to decide their own meaning of the story. Which books are you reading currently? I am actually reading the American Girl 'Kirsten' series with a small tween-age book club that I run for girls in my village. Nope- not a bit. It wasn't my story to be told. The characters, in my mind, actually lived the story. I can't change the story. They decided their own fate. I can expand the story though- and I'd love to write a sequal someday! "Be the change you want to see in the world." No explanation needed. I act on my complaints. Any message to the readers, aspiring writers? To the readers- hold true to yourselves. You are beautiful and wonderful and put here for a purpose. Never lose sight of your dreams. To the writers- write because you LOVE to write. Write your stories for yourself. Don't write in the hopes of becoming rich, write- because writing in itself makes you rich in ways money couldn't. We all beauty junkies would love to know about your beauty obsessions too. So tell us three beauty products you cannot leave the house without. --Jamberry nail wraps! These things are just lovely, and I cannot recommend them more! I love them and wear them all the time! My favorite rep is a girl named Mollie. You can visit her store here. --Mascara. I'm a mascara fanatic and love so many brands. I love the way it makes my eyes pop! --I know this isn't a product, but a braid in my hair is sort of my staple. I love braids. Little, big, styled, or messy. Braids are my beauty staple. I actually don't wear that much lipstick. I'm a fan of some simple clear lipgloss! A foundation you swear by? Covergirl Liquid Make-Up, 'Light Ivory' shade. I use a brush and dab the liquid foundation onto my face for a true air-brushed quality. I love that this 'light ivory' shade matches my really fair skin perfectly! A beauty tip that changed your life? Braid your hair after you shower and let it dry in the braid. In the morning, wake-up and un-braid your hair for really pretty, natural, slow bohemian waves. I LOVE this technique and use it all the time. I've always thought white eye-shadow in midwinter is so pretty. I love the way it mimics the snow, and makes your eyes bright even during the darkest period of the year! One makeup fiasco of your life? When I first started wearing make-up in 8th grade, I always wore a very dark blue eye shadow on my upper lid and under my eye. To this day I blush at my 8th grade school pictures. What was a I thinking? 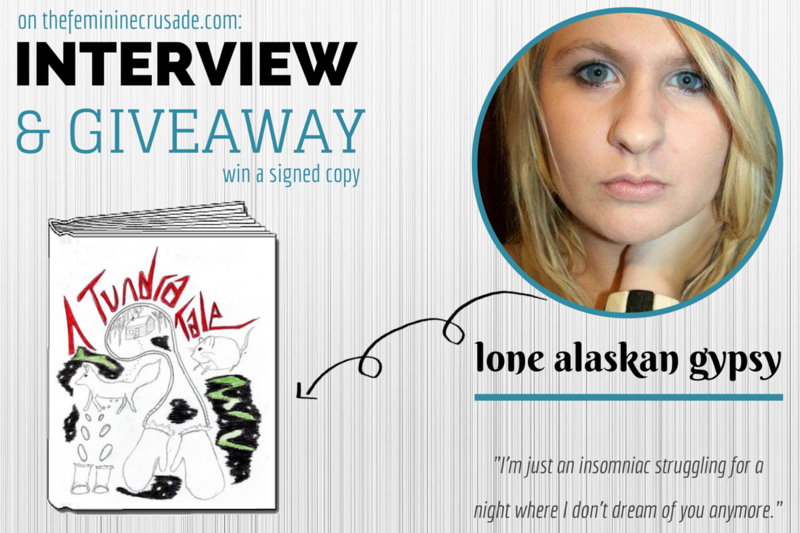 Thank you so much Lone Alaskan Gypsy for being a part of The Feminine Crusade. You are such an inspiring person! I can't wait to get hold of your book myself. And we are all waiting for your next success in April. And ladies, now for your favourite bit, one lucky participant can WIN a signed copy of 'A Tundra Tale'. THE GIVEAWAY IS OPEN INTERNATIONALLY. Ends February 10' 2015.